Executive Rooms are more spacious and aesthetically designed with all modern amenities, and have either queen or twin beds, and a well-appointed ensuite bathroom with separate shower. Additionally, one way complimentary Transfer 01 way to Church or railway station pickup / Drop plus extended checkout for 02 Hours. - FREE BREAKFAST AND COFFEE. - BAR AND COFFEE SHOP. 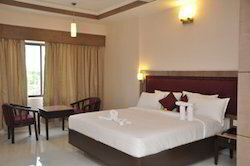 Suite Rooms is new dimension of luxury. Doors are protected with Electronic safety locks for you convenience.Suite room amenities include 32 inch HD LED TV with nonstop favourite channels, Glassed shower room and 24 hours hot and cold water supply, wireless internet access, luxury bathroom amenities. Designed for the modern-day business traveler, the deluxe room erases all your weariness away with its distinct comforts and luxuries. Hotel golden sand is one of the best budget hotel near velankanni church. This hotel is located very close to velankanni church and bus stand. This hotel has more than 100 rooms and a a/c restaurant. This hotel is very much suitable for budget customers.